One of the themes to come out of the Reformation is that the Bible is the highest authority for instruction in the Protestant faith. Five hundred years ago this Oct. 31, Martin Luther unwittingly and unofficially started what became the Protestant Reformation. Dr. Luther, who aimed to open a public debate on the Roman Catholic Church's practice of selling indulgences, nailed his Ninety-five Theses to the door of his home church in Wittenberg, Germany. He got more than he'd bargained for including excommunication, a death sentence, and—despite his personal foibles—a revered place in the pantheon of orthodox Christian Theologians. Despite his best efforts to live a righteous life, Luther found he could not. Until, that is, God revealed to him the truth of Romans 1:17, "the righteous man shall live by faith." (Romans 1:17b NASB, a quote of Habakkuk 2:4) Concerning this moment, Martin Luther wrote, "At last meditating day and night, by the mercy of God, Ibegan to understand the righteousness of God is that through which the righteous live by a gift of God, namely by faith"
This moment also led him to the foundational truth that generated the teachings of the Reformers then and of Christians who hold to Reformed theology today. The first and foremost of the Five Solas of the Reformation is Sola Scriptura—Scripture Alone. 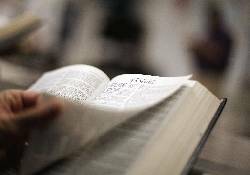 The Alliance of Confessing Evangelicals, Inc. provides a definition that says in part: "We reaffirm the inerrant Scripture to be the sole source of written divine revelation, which alone can bind the conscience. The Bible alone teaches all that is necessary for our salvation from sin and is the standard by which all Christian behavior must be measured." A clear understanding of Sola Scriptura will encourage and guide believers—still sinners saved by grace—in their daily Christian walk. And it will give any who wish to better know why Bible-believing Christians believe what they believe an avenue of insight. But is God's truth available to all? For us to understand, then, what God is saying anywhere in the Bible we must first read it at face value. Read it as you normally read the Times Free Press or The Road to Character. There are, of course, figures of speech, poetry, and so forth but even these are illustrations of truth. So, read it. Otherwise, there is no yardstick, no authoritative measure, and we each end up believing whatever we want to believe. We must eventually, I contend, read the Bible for what it claims to be in II Timothy 3:16—the very breath of God. Sola Scriptura—the Pillar of the Reformation—led Martin Luther to nail his Ninety-five Theses to the Wittenberg door—an event that changed the world and echoes its authority today. Remember this as we approach Reformation Day on Tuesday. Gordon Hall is a retired religious broadcaster, communications instructor and fundraiser. He is a consultant for a human-services consulting firm.